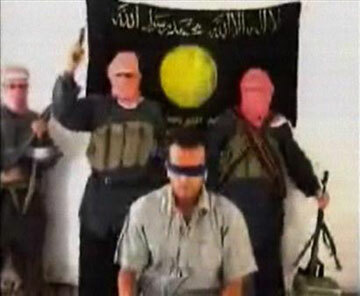 Masked gunmen shot a blindfolded Turkish hostage three times in the head on a gruesome Internet video meant to warn Muslim workers to stay out of Iraq. Soon after the video was discovered Monday, Turkish truckers announced they would stop hauling goods for U.S. forces in hopes of saving two other Turkish captives. The truckers' decision was the latest concession to militants who have taken more than 70 foreigners hostage as leverage to drive coalition forces and anyone supporting them out of the country. Between 200 and 300 trucks cross Turkey's southern border into Iraq every day to bring fuel, food and other supplies to U.S. forces. "As of today, those trucks won't be crossing into Iraq," said Cahit Soysal, head of the International Transporters' Association. However, it was unclear how the decision would effect U.S. forces; the military did not respond to requests for comment. Ercument Aksoy, head of the Turkish-Iraqi business council, said he thought Turkish drivers could hand off shipments to Iraqi drivers at the border. In recent weeks, militants, buoyed by the Philippines' decision to pull its troops out of Iraq to save a Filipino truck driver ― have intensified their kidnapping efforts. A few companies have withdrawn from Iraq, and several countries ― including the Philippines, Bulgaria, Kenya and Egypt ― have warned their citizens not to work here. The same al-Qaeda-linked group that killed the Turk said Monday it would free a Somali captive because his Kuwaiti employer agreed to cease business in Iraq. The killings of foreign hostages has been widely denounced by Iraqi religious figures, including radical Shiite cleric Muqtada al-Sadr. On Monday, U.S. Marines fought with gunmen protecting al-Sadr's house in clashes that killed one woman and wounded three other people in the southern city of Najaf, hospital officials said. Al-Sadr, whose followers fought a two-month rebellion against U.S. forces in April that died down after a series of truces, was in his house at the time, witnesses said. The U.S. military did not confirm a battle outside al-Sadr's house, saying only that Marines were attacked with small arms, rocket-propelled grenades and mortars while patrolling the city. The Marines returned fire, killing two insurgents, the military said. Witnesses said the fighting began when U.S. military vehicles entered the Zahra area near al-Sadr's house, which is protected by his militia, the Mahdi Army. But the Marines said they were only patrolling areas of Najaf authorized under the cease-fire agreement. Also Monday, Iraqi government and religious leaders lashed out at a coordinated series of car bombings on Iraqi churches during Sunday evening services that killed at least seven people and wounded 37. "We condemn and reproach these hideous crimes," said Iraq's most senior Shiite cleric, Grand Ayatollah Ali al-Husseini al-Sistani, who added that the attacks "targeted Iraq's unity, stability and independence." On Monday, an unknown group claimed responsibility for the church bombings and warned that more attacks would come. The statement, signed by an organization calling itself the Committee of Planning and Follow-up in Iraq, was posted on an Islamic Web site. The government said it did not know who was behind the bombings. "Sources of danger, however, are represented by al-Qaeda's followers and supporters of the former regime," Deputy Prime Minister Barham Saleh told reporters. Jordanian-born militant Abu Musab al-Zarqawi, who is linked to al-Qaeda, has claimed responsibility for a spate of recent attacks, including a coordinated series of suicide bombings and other attacks on police stations June 24 that killed 89 people and wounded 318. Al-Zarqawi's group often uses suicide bombers; the explosions Sunday came from booby-trapped cars. In light of the execution-style slaying of the Turkish worker by al-Zarqawi's group, Turkey's truckers association said it was immediately halting deliveries to U.S. forces in Iraq in hopes of freeing two Turkish drivers also being held hostage. Militants from al-Zarqawi's Tawhid and Jihad group said Saturday they would kill the drivers within 48 hours if their employers did not leave Iraq. Al-Zarqawi's group beheaded U.S. businessman Nicholas Berg, South Korean translator Kim Sun-il and Bulgarian truck driver Georgi Lazov. The move came after news organizations uncovered a video Monday posted on an Islamic Web site that showed militants forcing a Turkish worker, identified as Murat Yuce, to read a statement warning Turks not to work with U.S. forces. "I have a word of advice for any Turk who wants to come to Iraq to work: 'You don't have to hold a gun to be aiding the occupying United States. ... Turkish companies should withdraw from Iraq," he said. The next scene on the tape showed Yuce wearing a blindfold. One of the three masked gunmen behind him then walked up and shot Yuce in the side of the head. When he slumped over, the gunman shot him twice more in the head. The kidnappers, flanked by a Tawhid and Jihad banner, also warned foreign Muslims "not to support the occupier" and called Yuce an apostate. Yuce worked for Bilintur, a Turkish company that provided laundry services for a Jordanian company in Iraq. The U.S. State Department condemned the killing as "a heinous and barbarous act."